I, Dean MacKay, slept on 50 Couches in 50 Nights. These are my stories. Couch #19 belongs to Greg. Or more specically, to his girlfriend, Nicole and him. They live in the Bartlett Building, in a converted loft that Nicole owns, in the Historic Core of Downtown Los Angeles, California. They live their with their chihuahua, Princess. Nicole and he have a group of friends, called Tren Way Bicycle Gang. One of the members of the group had the couch in their office on Magnolia in Burbank. He had a little IT business there. They used to have after hours parties there and Nicole absolutely loved the couch. 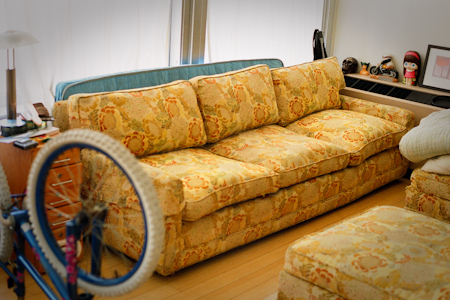 Initially another friend took the couch for a while, but then wanted to get rid of it. Nicole and Greg were moving into the loft and arranged to pick up the couch. It was 4 sections long and was too large to be moved into their place. Nicole and two friends just couldn’t get it around the tight corners of the old downtown building. Once they had tried everything, Nicole then hired two guys she found on Craigslist who struggled for 3-4 hours with it. They were able to get it up the stairway to the fifth floor, but were not able to get it down the narrow hallway to the loft. Once they had done all that they could Nicole then contacted friends who had had some reupholstery done recently for some advice. The people that had done the reupholstery work took the couch then proceed to chop off and remove one of the sections and reattach the arm. It was now a smaller, 3 section couch, and was able to be moved into Nicole and Greg’s place. As you can see, it has a lot history among their friends. And it is definitely comfortable to lie on. Greg is employed doing IT work at NBC TV Stations in Burbank. Greg and Nicole like riding bikes and camping, and they are into photography and music. Greg is just getting into playing music. They also like seeing bands and watching movies. Opposite of where he is at now, which is being environmental and green and riding bicyles, Greg raced motorcycles as a kid, off-road, in the desert. He was really good at it and successful. Greg then went off to college and gave it up. It’s kind of dangerous. Bicycles are alot cheaper and safer. Couch #22 – Stephen S.